The book opens by sharing tales of the volunteer ambulance units from the Western Front, which also led to the involvement of the American Red Cross in Italy. This was where Hemingway came to know many of the experienced drivers from France. In the spring of 1918 the young writer enlisted, serving first with an ambulance unit in Schio and then as a canteen worker at the Piave River until he was wounded. After the war when the volunteer outfits disbanded, Hemingway returned home where he took up his plan to earn a living as a writer. Hemingway’s Red Cross experience was a major influence on his development as a writer and a thinker. Through the power of words, Hemingway’s journalism, short stories, and novels exposed the falsehoods of World War I propaganda. 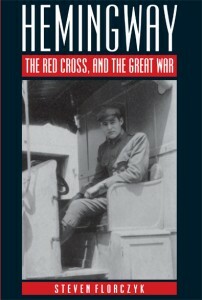 His involvement with the Red Cross led to some of the finest American literature on the Great War. AuthorSteven Florczyk teaches in the English Department at Louisiana State University. His scholarship on Ernest Hemingway has appeared in The North Dakota Quarterly and Hemingway’s Italy: New Perspectives. His current research deals with American writers and World War I.